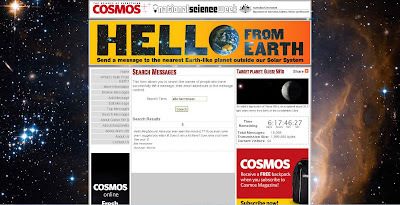 Have you sent a message to the next Earth-like planet out of our solar system? Well, I have and I think it is mighty important to let them know what we are up to and get them "in-the-know" - and if we are worth visiting. Who knows if they are even there, or whether they even have the equipment necessary to receive the messages. Perhaps they don't even need radio receivers - maybe they're so advanced, they pick the message up right in their huge, disc-shaped heads! But, imagine if we were to get a message back? Well, I hope they will read mine and respond. I did a search, as my message was finally approved to send to them ... I didn't want to go through all 18,000 messages. If I do get a message back, it should provide some interesting reading for me once I've retired, as the messages will take approximately 20.3 years to travel each direction. Y'all should hurry and share a few words as you only have 6 days left! What will you say to our fellow neighbours? You can send your own message here : http://www.hellofromearth.net.